DC's transit system is one of many across the country facing budget and ridership woes during the recession. Photo: MJM, flickr. As the latest installment of its series Moving through the Recession, TheCityFix DC conducted an email interview with Thomas Harrington, the Washington Metropolitan Area Transit Authority’s Director of Long-Range Planning. Parts 1 and 2 of the series, featured on TheCityFix Global, documented the 2008 peak in transit ridership and subsequent slippage, as well as the ongoing service cuts being experienced across the nation. The Washington area is no exception to these trends. Harrington discusses the impacts of the recession here at home on DC’s transit services and riders. Among his biggest concerns is dealing with an estimated $189 million budget shortfall. According to recent public hearings, he says, people favor moderate fare increases, as opposed to service cuts. 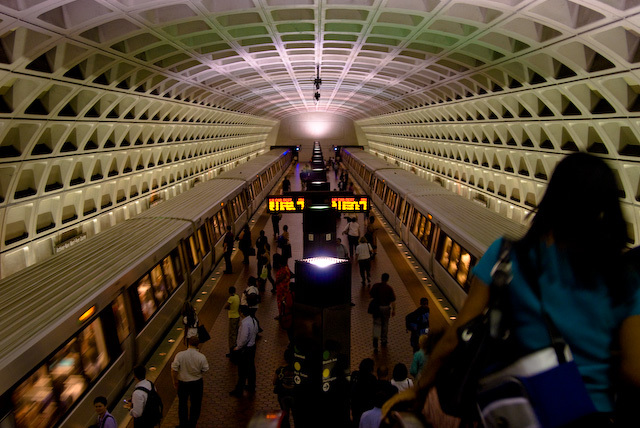 TheCityFix DC: How has the recession impacted Metrorail and Metrobus ridership? Thomas Harrington: Ridership in Fiscal Year 2010 (July 2009 – June 2010) was down for both Metrorail and Metrobus. Through the first six months of FY2010, total ridership was 172.6 million trips, 7 million trips below the same period last year and 14 million trips below what we had projected in our budget. The drop in ridership in FY2010 came after a continuous period of growth in both rail and bus ridership from previous years. Prior statistical analysis has shown that weekday ridership for bus and rail is highly correlated with downtown employment levels. The drop in bus ridership is more significant than for rail, and we believe that may be due to the state of the economy, which has resulted in a loss of jobs in the service sector. The overall decrease in Metrorail ridership includes the decrease in ridership that occurred in July and August 2009 and was related to the reduced service levels on the Red Line after the fatal train collision in June 2009. Author’s Note: According to supplementary materials provided by Harrington, Metrorail is also experiencing a growth in short trips and a decline in long-distance trips. The economic downturn seems to be impacting longer trips, while the growth of population and activities in the core are influencing the rise in shorter trips. TCF DC: How has the recession impacted your budget? TH: As has been well publicized, Metro is confronting a significant shortfall in its fiscal year 2011 operating budget. If Metro were to offer the services it currently offers without change and to receive the revenues currently forecast, Metro staff estimate the system would experience an operating deficit in FY 2011 of $189 million. The recession affects Metro’s budget in a few ways. The most direct impact is the drop in revenues due to the ridership decreases discussed above. Metro’s advertising contract expires this year, and we expect any new contract to provide significantly lower revenue. As the economy has faltered, so has the private sector’s ability to maintain or implement costly advertising campaigns. Finally, the recession has affected all of the local governments in the region, which provide about half of Metro’s total operating and capital budget annually. Metro’s preliminary budget proposal to close the $189 million shortfall includes a combination of fare increases, Metrorail and Metrobus service reductions (a last resort), changes to the MetroAccess fare structure and service area allowed under the Americans with Disabilities Act and administrative cuts, including a reduction in personnel. Another $40 million has yet to be identified to fully close the gap. TCF DC: Do you have any projections of impacts on ridership, commute times or air quality if you were forced to cut service? TH: Our General Manager and our Board of Directors are always hesitant to reduce service and they have stated publicly that any service reductions will be considered as a last resort. We know that people rely on us to get from point A to point B and a reduction in service will impact that trip. This is one reason that we look at ridership and travel time impacts when we are considering service reductions. This type of detailed information is often included in public hearings on service changes. We do not typically consider air quality impacts. It is unclear whether the service changes considered in the past (for example, adjustments in span of service or headways on a few bus routes) would have a significant impact on air quality. A public hearing was conducted January 27, 2010 to obtain public comment on proposed measures to bridge the estimated $40 million operating budget deficit Metro is facing at the end of Fiscal Year 2010. Generally people indicated that they preferred a modest fare increase to a reduction in service. The public hearing report documents some of the service changes that were considered and provides a summary of public testimony. Author’s Note: Greater Greater Washington has covered the ridership impacts of various proposed service reductions for Metrorail and Metrobus. For Metrorail, these range from 60,000 riders lost annually with lesser changes like seasonal adjustments and weekend station closures, to 2.7 million riders lost with major cuts, such as widening weekday headways and reducing weekday peak service. For Metrobus, ridership losses could range from 935,000 to 3,874,000 annually, depending on the severity of service cuts. Additionally, some of the proposed service reductions – headway widening, reducing weekday peak service, restructuring red line service, etc. – would have clear implications for commute times. TCF DC: Have you done any analysis of how much users are willing to pay to maintain service at present levels? TH: We don’t have quantitative data on willingness to pay to save service, but we do have feedback from the public on the subject, which is included in the post-hearing report. At the January hearing, a majority of respondents were in favor of fare increases and opposed to service cuts. We heard similar feedback when we considered possible service cuts in 2009. TCF DC: How could local jurisdictions assist you now and in the future in order to avoid these issues? TH: The reason for budget shortfalls in recent years is simple – revenues and subsidies have not kept pace with the cost of providing the service that the region demands. Metro, like all other public transit systems in the U.S., does not fully cover operating costs with farebox revenue. Funding for Metro’s annual operating budget includes 50% from passenger fares and parking fees, 40% from state and local funds, and 10% from other revenue sources such as advertising. Metrorail has one of the highest farebox cost recovery ratios in the country – with roughly 80% of costs paid for by customers or from other revenue sources. Metrobus fares cover about 30% of operating costs, which is similar to other bus systems around the country. MetroAccess fares cover only 4% of operating costs, a significant concern because of the rapid growth in paratransit trips – up 33% just in the past two years. In order to sustain public transit service, the region will need to look for new approaches to managing the rise in operating costs, such as priority lanes for buses on roadways and managing the demand for paratransit services. Because Metro’s bus and rail fares have not kept up with inflation, the region has historically stepped in each year to increase Metro’s operating subsidy to ensure the agency’s fiscal stability. In recent years, however, Metro’s funders have been significantly challenged to continue providing the subsidy increases. There is a need for the region to address Metro’s ongoing funding requirements in a more comprehensive and long-term way. TCF DC: How was Metro impacted by previous recessions? Were there any lingering effects after the economy picked up? TH: There have been previous recessions, particularly in the mid-1990s, that had a big impact on Metro. Typically ridership has rebounded quickly and the overall growth trend has been positive. In the 1992-1995 timeframe, a significant amount of bus service was reduced in the District of Columbia due to a lack of funding support from the DC government. TCF DC: Has Metro experienced any other unexpected impacts of the economic slowdown? TH: No. From the perspective of long-range planning, it has been noteworthy to see how the recession came on the heels of record ridership growth in 2008 due at least in part to high gasoline prices. While the focus in the short term is on sustaining the system, the long-term outlook suggests that ridership growth will return soon, particularly if gas prices increase. Metro is projected to continue growing over the next 10 years, with a 20% increase in ridership on Metrorail and 10-15% increase in ridership on Metrobus expected by 2020. MetroAccess, the paratransit service for people who cannot use fixed-route bus or rail systems, is expected to experience the fastest growing ridership over the next ten years with an increase of 112%.